Note: The low birth weight database has not been updated since October 2014. Given that the data are out of date, aggregates for a number of regions and the global value have been suppressed. New methods are currently being applied to generate estimates through an inter-agency process and updates will be available in the next State of the World’s Children Report. A baby’s weight at birth is a strong indicator of maternal and newborn health and nutrition. Being undernourished in the womb increases the risk of death in the early months and years of a child’s life. Those who survive tend to have impaired immune function and increased risk of disease; they are likely to remain undernourished, with reduced muscle strength, cognitive abilities and IQ throughout their lives. As adults, they suffer a higher incidence of diabetes and heart disease. The incidence of low birthweight, defined as the proportion of newborns weighing less than 2,500 grams, is monitored through both health system surveillance and household surveys. In 2013, nearly 22 million newborns—an estimated 16 per cent of all babies born globally that year—had low birthweight. Accurate monitoring is challenging, however, since nearly half of the world’s infants are not weighed at birth. Among regions, South Asia has the highest incidence of low birthweight, with one in four newborns weighing less than 2,500 grams. South Asia also has the highest rate of infants not weighed at birth, at 66 per cent. Although data on low birthweight are adjusted to account for under-reporting, they are still likely to underestimate the true magnitude of the problem in the region. Note: Regional aggregates presented where adequate population coverage is reached. Source: UNICEF global databases, 2014, based on Multiple Indicator Cluster Surveys (MICS), Demographic and Health Surveys (DHS) and other nationally representative surveys, 2009─2013 (for % not weighted is 2008-2012), with the exception of India and Indonesia. Trend data from household surveys (MICS and DHS) are limited, covering about 60 per cent of the developing world’s population, excluding China. However, the data indicate that the incidence of low birthweight remained unchanged from the 1990s to 2010 in both sub-Saharan Africa and Asia. Data coverage was insufficient to calculate estimates for other regions. UNICEF and WHO, Low Birthweight: Country, regional and global estimates, UNICEF, New York, 2004. Barker, D.J. (ed. ), Fetal and Infant Origins of Adult Disease, BMJ Books, London, 1992. Blanc, A.K., and T. Wardlaw, ‘Monitoring Low Birth Weight: An evaluation of international estimates and updated estimation procedure’, Bulletin of the World Health Organization, vol. 83, no. 3, March 2005, pp. 161─240. Birthweight is the first weight of the newborn obtained after birth. For live births, birthweight should preferably be measured within the first hour of life, before significant post-natal weight loss has occurred. Low birthweight is defined as less than 2,500 grams (up to and including 2,499 grams). The indicators presented on this page, ‘incidence of low birthweight’ and ‘children not weighed at birth’ are defined in the table below. For industrialized countries, the main sources of information on low birthweight are service-based data and national birth registration systems. 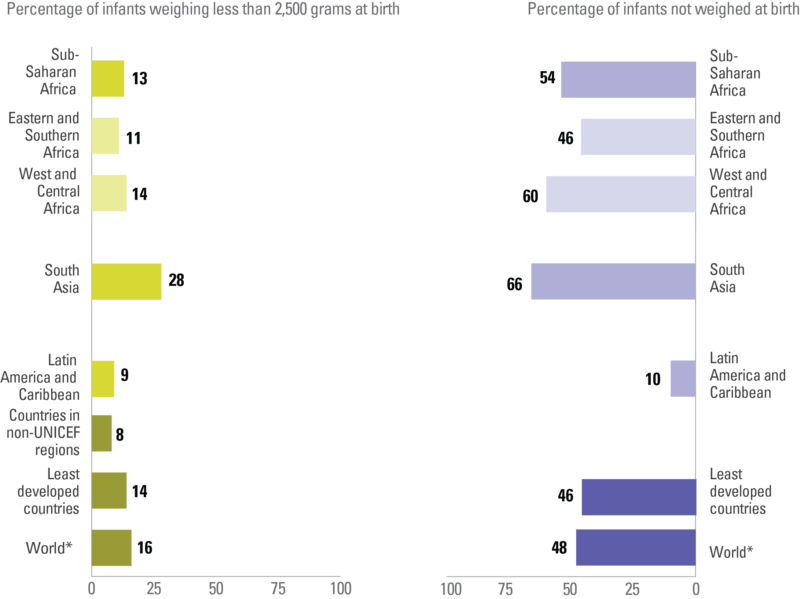 For developing countries, low-birthweight estimates are primarily derived from national household surveys, as well as data from routine reporting systems. Within the same country, the relationship between birthweight and the mother’s assessment of infant size does not depend on whether the infant was weighed. It should be noted, however, that adjusted rates may still underestimate the true magnitude of the problem. It is critical, therefore, that all babies be properly weighed at birth.